It is not enough to have a good mind. The main thing is to apply it well. In my high school philosophy class, I have sincere fun, and probably take too many liberties when we discuss the contributions of Rene Descartes, whom I regard as the Father of Modern Philosophy. Possessing a weak constitution prone to tubercular-related illnesses, he suffered from a cold snowy night in Ulm, Germany on November 10, 1619. Crawling into the stove chamber of the building where he was housed, he spent the night deep in thought, resolved not to emerge until he had gotten to the bottom of some issues troubling him. He did, and emerged with a changed life the following morning. Last night marked my fifth night going to bed without a working furnace in my house, and as temperatures slid downward toward 27 degrees, I huddled closer to the electric space heater, drifting into sleep around 10:00, a good two hours before I generally retire. At about 4:00 a.m. I awoke in the frigid darkness and lay there, thinking, waiting for a 6:00 alarm to convince me that it was time to crawl out from under the quilts. Having a good memory for dates, I realized that I was lying in the cold, thinking, 395 years and one week after Descartes’s historic night. 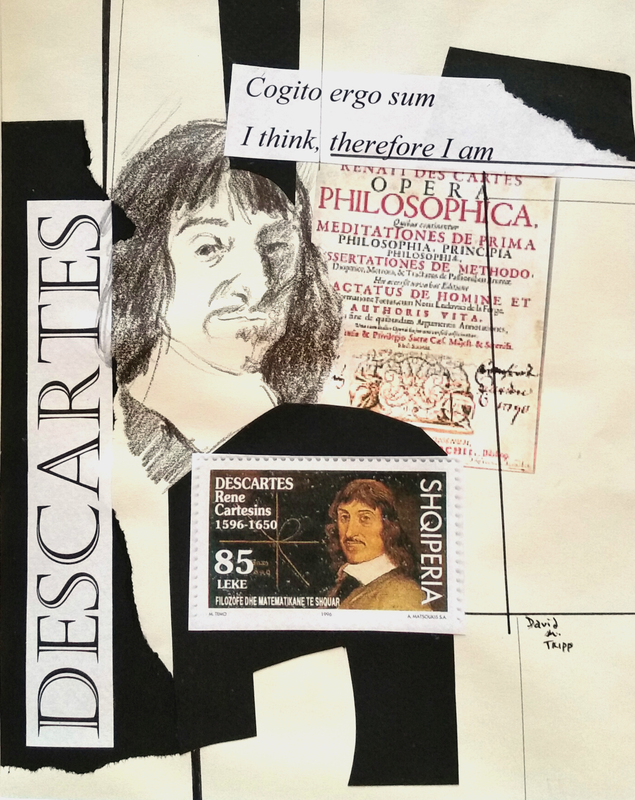 Like Descartes, I thought about my life, my art, my ideas, and wondered about a firm, unified foundation, an Archimedean point for leveraging my efforts. My mind drifted over to Thoreau’s Walden and his musings about finding a point d’appui, a point of support, a solid footing. I had spent the prior night engaged in the most meaningful conversation over coffee with another artist seeking answers about the marketing side of the artistic enterprise, and was stirred by much of what we discussed. These matters were also percolating in my mind as I lay there in the darkness. When I finally rose at 6:00, I was elated to find an email from the other artistic spirit with whom I had conversed the night before, and immediately I felt a profound sense of connection with that artist’s mind, along with the minds of Descartes and Thoreau. What company! What a conversation! As Descartes recounted the thoughts he pursued throughout that historic night in 1619, he concluded that even if his thoughts were in fact dreams, even if they were in fact fallacious, that nevertheless he was thinking, and therefore he existed (cogito ergo sum). And as I rose from my bed, feeling much better than I did hours before, I concluded that I have ideas, artistic aspirations, and authentic goals. Though I still seek some kind of center, some kind of foundation, I am delighted to know that I am in motion and not static. And as long as I strive, there is still reason for hope. And to me, the journey is just as worthy as the destination. I recall a book title in my library: Success is the Quality of Your Journey. Perhaps it’s time to go back and take a look at that volume as well. At any rate, I have school responsibilities now pending, so it is time to answer that call. But I will return to this . . . The image posted above is the property behind a friend’s ranch where I stayed as a guest a few winters ago while spending Christmas holidays visiting my parents in the St. Louis area. 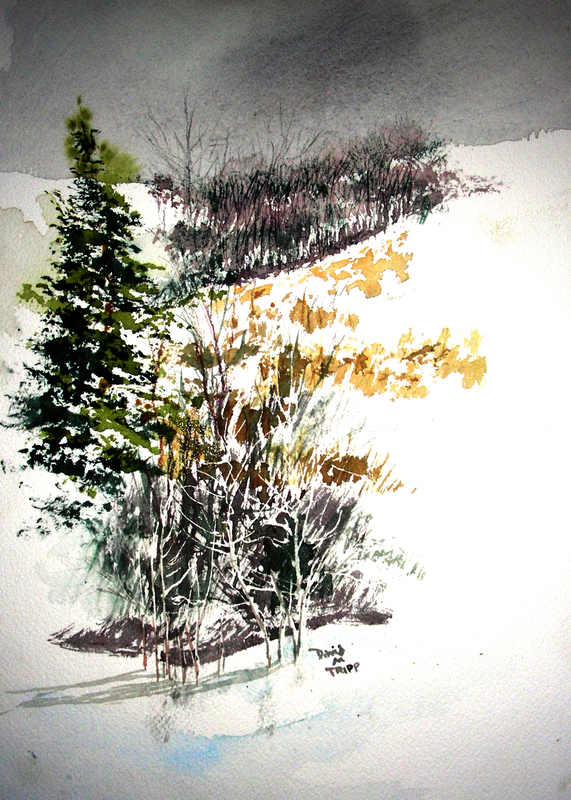 I stood in his kitchen and looked out through the glass patio doors at the beautiful snow across his sprawling woods, and worked on this quick watecolor sketch, so I guess I could say I was painting en plein air, though I was indoors, and warm. Andy, I’ll tell you about that. I’d been writing a very complicated, long-drawn-out poem, almost a story type of poem entitled “The Death of the Hired Man.” I had finished at two o’clock in the morning. It was a hot August night, and I was exhausted. I walked out on the porch of my house and looked at this mountain range. It came to me in a flash! I wrote it on an evelope I had in my pocket, and I only changed one word. It came out just like that. About an hour ago, I was prompted on Facebook that it was snowing in south Arlington. Though cold inside, I wrapped up and dashed outside in genuine joy, walking through my yard, out into the street, and then out into my backyard, looking up in wonder at the night sky filled with those beautiful flakes. I just wanted to bring my coffee outdoors and spend time walking around in it. But alas, I have promises to keep, a power point to finish, sleep to accomplish, and classes waiting for me tomorrow. Promises to keep. And miles to go before I sleep. But I’ll still feel this gratitude. It is a beautiful night, capping a beautiful weekend. the frost perched on the town. then it gobbled summer down. and all the trees are shivering in a naked row. Summertime is falling down and winter is closing in. After a second shivering night without a furnace, it was a genuine pleasure to meet with a writer and creative spirit for a 6:30 breakfast in front of a roaring fire place. The conversation was first rate, and there just doesn’t seem to be enough of those available today. So . . . (you know who you are!) . . . thanks for a fabulous breakfast and most soulful chat. Thanks for a wonderful beginning to this cold morning. I’ve posted these lyrics above that have haunted me for years now. I had no idea that Joni Mitchell penned the words, as I’ve listened to the song performed by Crosby, Stills, Nash. And though the song was never a hit, it remains one of my favorite, most soulful pieces. I love the approach of the year-end holidays and the change in climate, mostly for the memories–an admixture of joy and sadness, gratitude as well as regret. Soulful. That is the best way I can describe the coming season. And I welcome it. Painting is the trade that takes longest to learn and is the most difficult. It demands erudition like that of the composer, but it also demands execution like that of the violinist. Right now, the house and studio are too cold for painting, but at least I could study it further with the plethora of books I have surrounding me now. And I have the time . . . I look forward to seeing my family again during the Christmas holidays. There is a slight chance of a white Christmas this year. I photographed this storefront on the south side of St. Louis last Christmas. 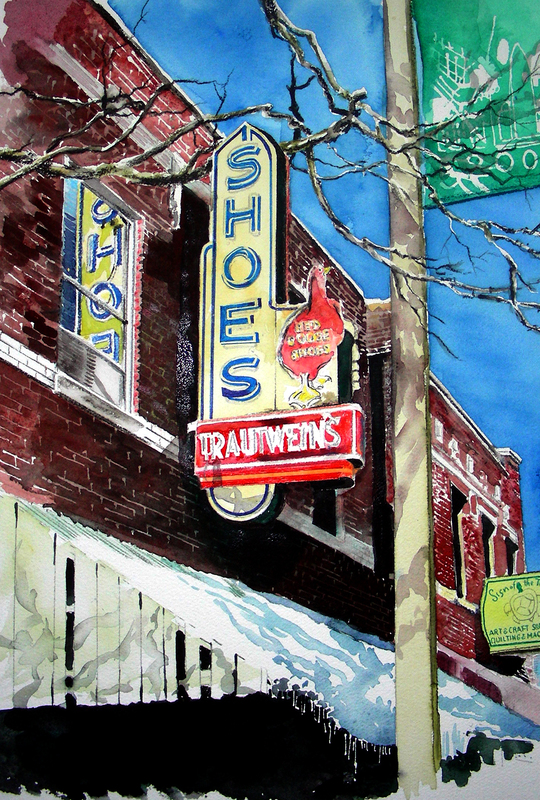 It is located on Gravois Road (which turns into Highway 30 eventually), lying on the historic Route 66 stretch through the city. Unfortunately the store is abandoned, but I spent several minutes peering in through the display windows, remembering the Red Goose Shoe commercials from my childhood. I hope to get a second look at this south side neighborhood this weekend when I’m in St. Louis. I wish I could see more of these sites, there seems to be so little time to re-visit my home town. I was happy to receive 2nd place in the Desoto Arts League Annual Member Show with this entry. 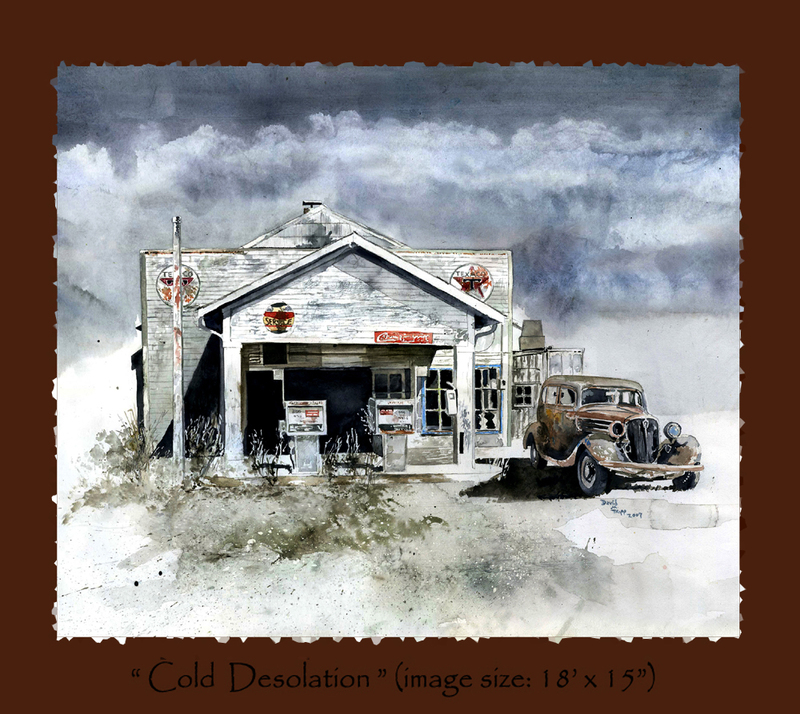 I titled this “Cold Desolation” and painted it back in 2007. I photographed it much, much earlier, over a Christmas holiday season back in the 1990’s. My father was driving me around abandoned towns in Franklin County, Missouri so that I could shoot my 35mm camera for potential watercolor compositions. It was about 10 degrees when we came across this abandoned filling station in Robertsville, Missouri, not far from Pacific. I had to add the signage, as the building had been stripped of all identification and advertising. The automobile was photographed in New Mexico, years later. As to this site, I still recall how frigid cold it was, and how I had to keep putting my hands back into gloves to survive the photo shoot! I stayed around long enough to shoot over thirty pictures, though some of them did not turn out the way I wished. This painting has had a hard life. After I had finished the sky, I leaned the watercolor against the wall of my study. 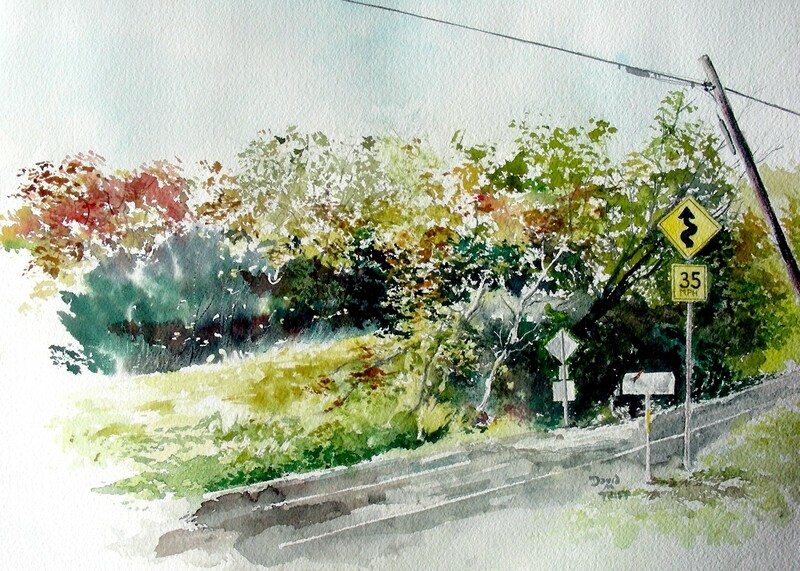 In those days, I was stretching D’Arches watercolor paper over canvas stretchers. I love the dynamic spring of the paper while working on it, and the water dries much more quickly than it does with blocks or 300 pound weight. While the picture was leaned against the wall, I pushed some books off my desk, and they tumbled across the floor and punctured this painting in several places. For that reason, I have been unable to sell the original through galleries (though I’ve sold a number of limited edition giclees, and now the original has won two awards in competition, including a Best of Show. 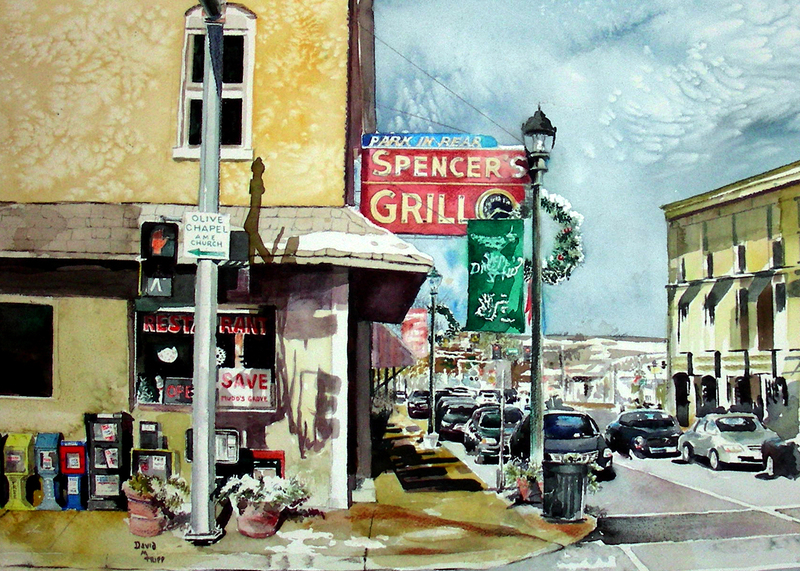 It was also juried into the annual show of the Southwestern Watercolor Society. Nevertheless, it remains a damaged painting, scotch-taped from the back. I’m attached to this work because to-date it remains the best watercolor sky I have ever laid. I still cannot believe how the colors worked and the blotted clouds emerged the way they did. 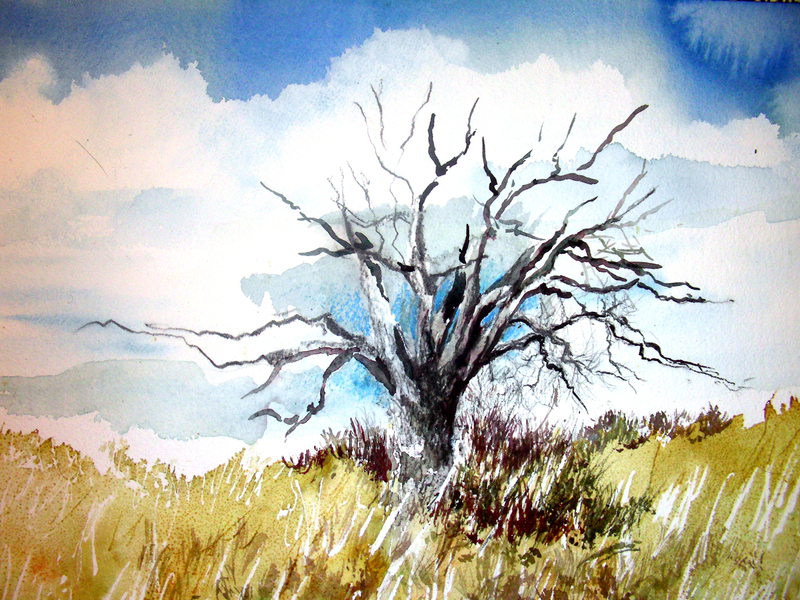 It also marks a former period when I worked only in neutral colors, mostly under the spell of Andrew Wyeth. The creation of the work also evokes warm memories, as I worked on the sky in the winter months, then abandoned the work when the spring semester got under way. The next thing I knew, several years had passed. Finally, I decided to take it with me during a 3500-mile road trip one summer that took me through Oklahoma, Missouri, Kansas, Colorado, New Mexico and Texas. It was during my Colorado fly-fishing expedition that the painting was completed, in Canon City. I plan to re-visit this Robertsville, Missouri site in a couple of weeks when I return to St. Louis to visit my family for Christmas. Currently, I have over twenty 35mm slides taken from all angles of this station, and I’m considering a fresh start on this composition again. I think the time is overdue. When Christmas comes, this is one of the few paintings from my past that I still own, and still spend plenty of time studying. The painting will remain in Desoto City Hall until the first week of the New Year. I”ll be looking forward to retrieving it and re-hanging it in my home. My New “Cafe Press” Store Now Open for Business! It has been a long time coming, but finally, I have my first line of products ready for sale on http://www.cafepress.com/recollections54. Currently I have Christmas cards, general “winter wonderland” greeting cards and one tote bag ready for sale. As the days unfold, I will continue to add new products to this line. This has been an exciting adventure for me, a new direction in the enterprise of making and marketing art. I will do my best to blog daily, though I have several events tumbling in over the next few days. Tomorrow and Friday, a group of us at Martin High School will be selling our own handmade arts and crafts at a holiday bazaar. Saturday is the opening of a new show in which I’m participating with my watercolors at Burson Gallery, 207 East Elm Street, Hillsboro, Texas. The opening reception will be 3:00-5:00. Next week, I will be selling my art work out of my classroom (room 114) at Martin High School in southwest Arlington, Texas, where I teach. I also have two new commissions to tackle, with crunching Christmas deadlines. But nevertheless, I will try my best to keep this blog breathing. The details on this 9 x 12″ watercolor are really slowing me down today. It looks as though I’ll need one more day to finish it. What a surprise–I really expected to finish this on the first day instead of the third. Too many details and colors, I suppose. I am getting “drawn in” as I focus on the composition, however, and I’m really finding the Prismacolor watercolor pencils to be a real asset in this enterprise. I’ve experimented with this product for over a month now, and am finally getting some results from it that are pleasing to me. Thanks for reading. I really hope before another week rolls by that I’ll have two new Christmas cards ready for production. 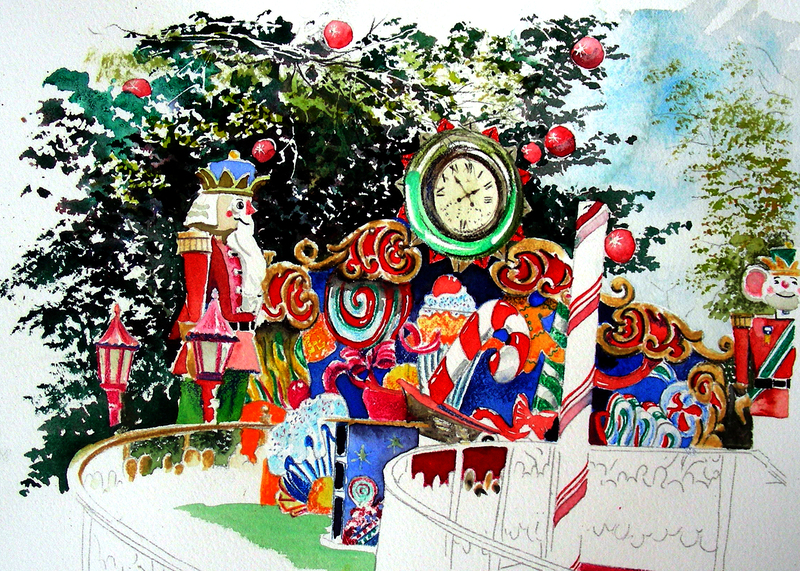 I got pretty sleepy as I continued tooling over this small watercolor (9 x 12″) that I’m hoping will reproduce into a decent Christmas card for the 2011 season. About an hour after I quit, I got this incredible post that encouraged me, and I couldn’t help but return for another round. As temperatures outside reached downward toward 30 degrees, I found the garage getting intolerably cold, even though I was working in a ski sweater. Right now, I’m wrestling between hauling all my watercolor supplies into the house or just settling into a comfortable book and waiting for sleep to arrive. At any rate, I’ll no doubt have to drag the supplies into the house in the morning. Thanks for reading. 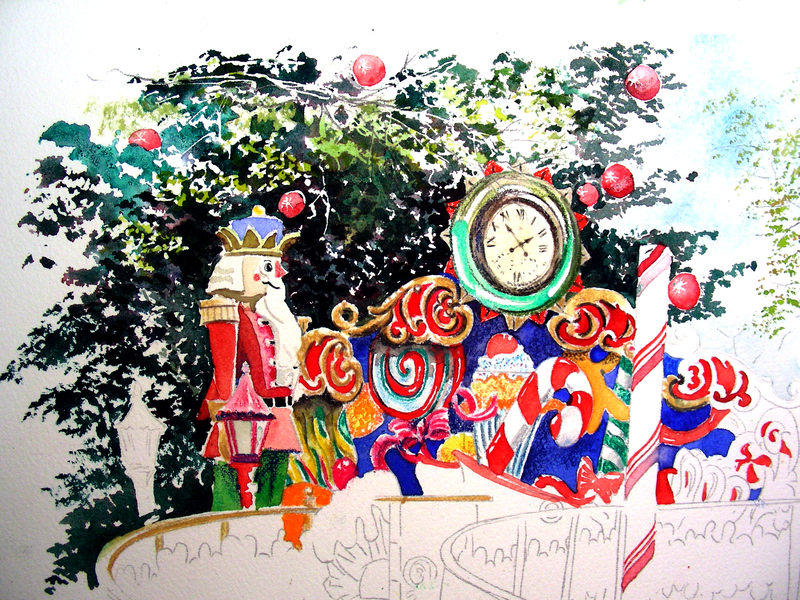 This particular watercolor/Christmas card is starting to get hold of me.